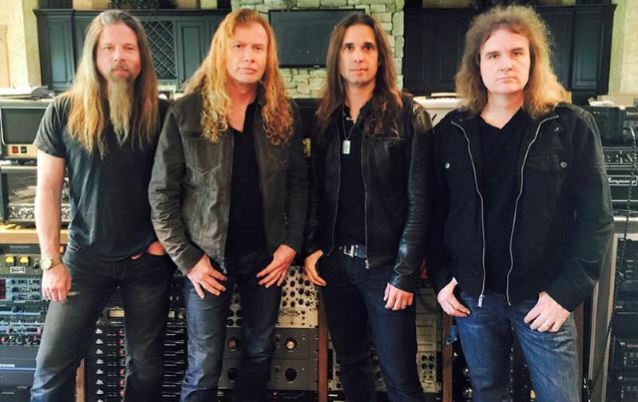 MEGADETH recently finished recording its fifteenth album in a Nashville studio for a tentative late 2015 or early 2016 release. The production duties on the follow-up to 2013's "Super Collider" were handled by MEGADETH mainman Dave Mustaine and Toby Wright (ALICE IN CHAINS, KORN). The CD is currently being mixed by Josh Wilbur, who has previously worked with LAMB OF GOD, ALL THAT REMAINS and GOJIRA. The new MEGADETH album will be the band's first to feature LAMB OF GOD drummer Chris Adler and Brazilian guitarist Kiko Loureiro, best known for his work with ANGRA. They were recruited earlier this year following the departures of drummer Shawn Drover and Chris Broderick, who have since launched a new project called ACT OF DEFIANCE. Mustaine told Revolver magazine about MEGADETH's forthcoming CD: "There's a lot of riffing going on in there, that's for damn sure," he said. "There's a lot of solos, a lot of pounding drums and bass. I knew from the start that I wanted to go back to my roots, and I wanted to make a thrash record." Mustaine spoke to Rolling Stone about his mindset during the making of MEGADETH's new album. He said: "Over the years we've always said, 'We're going back to our roots.' But the naysayers, they just want 'Rust In Peace' 20 times, which is never gonna happen. Because I've never written the same song twice. Unlike a lot of other rock and metal bands that, you know, they rely on a set formula, I try and make the songs all different. The funny thing, though, was that when [MEGADETH bassist David] Ellefson was doing the bass tracks, I was telling him, 'This is the 'Tornado' ['Tornado Of Souls'] part,' 'This is the 'Bad Omen' part,' 'This is the 'Black Friday' part,' 'This is the 'Holy Wars' part.' Because a lot of the things were in that kind of vein. Now, is it going back in time? Hell, I don't know. But I like what I'm hearing." He also talked about MEGADETH's new lineup, which made its live debut earlier this month at the Festival D'été De Québec (also known as by its acronym FEQ, or Quebec City Summer Festival in English), in Quebec City, Quebec, Canada. He told Revolver: "When Chris and Shawn left, it saddened me a little because they didn't say goodbye," Mustaine said. "They were pissed, because they'd gotten word that people wanted the 'Rust In Peace' [lineup] reunion [with guitarist Marty Friedman and drummer Nick Menza]. And frankly, I didn't; I was happy with those two guys. So when they left, it was like, 'It isn't going to be easy to replace them!'" He continued: "We haven't found a permanent drummer yet, but finding Kiko was really a mind-blower. It was the first time since Marty Friedman joined the band that I was really intimidated as a player. He's such an amazing talent, and he's been coming in with all of these fresh ideas." Adler, who has previously said that MEGADETH was the band that made him want to start drumming to begin with, was involved during the songwriting process for the group's new album. "MEGADETH is MEGADETH," Mustaine told Revolver, "and the songs will kind of tell you where they go. But there were several times while we were tracking where Chris would say, 'I think these parts should go like this, because that's how my MEGADETH is.' I was like, 'Yeah, I like that 'my MEGADETH' stuff!'"